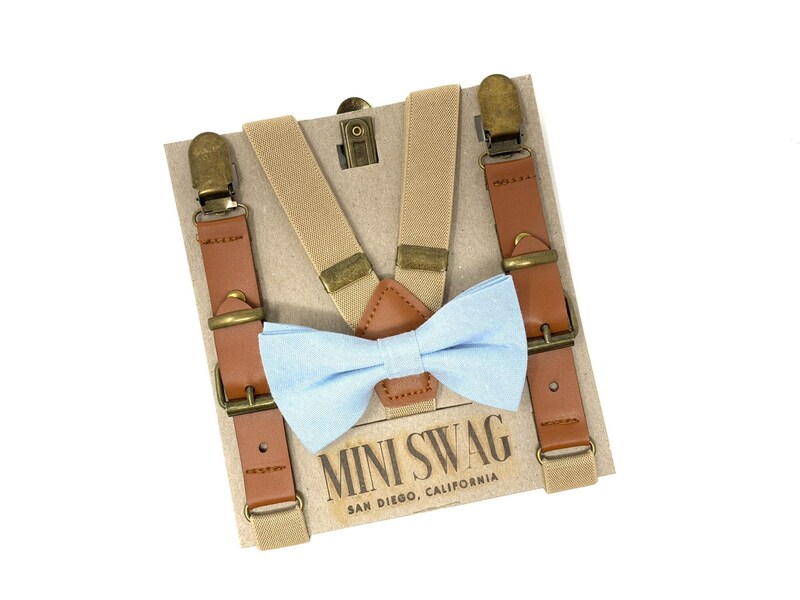 Your little guy will be the talk of the night when he shows up wearing this adorable light blue bow tie and khaki leather suspenders! This set is perfect for a ring bearer outfit, wedding outfit, birthday party, cake smash, family photos or any other special occasion. These kids vintage look suspenders are made from PU faux leather, khaki elastic and antiqued hardware. The elastic is extremely stretchable for a comfortable fit and the antiqued clasps easily attach to most clothing. This 100% cotton bow tie is a beautiful light blue. It is double layered and reinforced with interfacing so it will hold its form well. The bow ties come in 2 attachment options- on an alligator clip (best for squirmy little guys) or an adjustable elastic neckband (best for older kids). See images. COLOR SWATCHES- Color swatches are free! Send us a message and we will be happy to pop swatches in the mail to you. ~ SET - includes a bow tie and suspenders. Choose between a clip or neckband. ~ SUSPENDERS - includes one pair of suspenders only. ~ BOW TIE - includes the bow tie only. Choose between a clip or neckband.